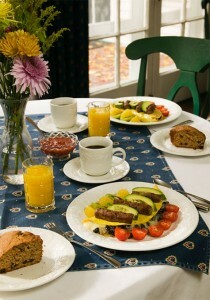 So many people tell us that their dream is to own a bed and breakfast. They fantasize about the fun with guests, having an amazing historic home, getting the chance to cook for others and getting paid to work from home. But the reality of innkeeping is so much more than this fantasy and I think people don’t realize all that’s actually involved. Let me preface this post by saying that I LOVE my job. I wouldn’t trade it for the world. It is my calling and something that I wake up feeling grateful to be doing every day. With that, however, there are so many things people don’t consider when they see owning a bed and breakfast at face value. Myth #1: This is something fun to do in retirement. If you think this is retirement and you won’t really be working, think again. I can promise you that you will not only put in hours like you did at a normal 9 to 5 job, but you will also be working physically. It’s exhausting on every level, physically, spiritually and emotionally. Your are “on” 24/7, whether you are taking care of guests or just answering phones/emails. You will be climbing stairs, kneeling, crouching, getting into nooks and crannies to clean and otherwise taxing your body in ways you didn’t expect. You will be making small talk and perpetually getting to know people, which is fun, but also requires a lot of energy. And even if you aren’t running a bed and breakfast and restaurant combined like we do, you will work long hours between breakfast preparation, service, clean up, room turns, check ins and otherwise accommodating guests needs. That doesn’t even include the busy work like accounting, marketing, social networking, etc. So no, you will NOT be retired. Myth #2: You can take time off whenever you want to. This one is kind of true, although you are never REALLY off. You always are connected and taking care of your business, even if you are on vacation. And it’s really hard to commit to taking time off. No matter when you do it, you stand to lose revenue. There is no such thing as paid vacation which means if you don’t work, you aren’t making money and you aren’t paying the bills. I can tell you, that’s probably the biggest stress of all for me. The knowledge that you will always have something due to pay but you may not have the revenue stream to accommodate those expenses. Either way, you have to force yourself to take the time off because you will get burned out and your guests will notice. Myth #3: Having people in your home and touching your stuff won’t be a big deal because people are generally respectful. For us this one partially doesn’t hold true because we bought this property with the intent of it being a business and are not all that attached to anything in it aside from a couple of personal items (like my Celine Dion autograph which is sacred so don’t touch!!). However, a LOT of innkeepers take their family homes after their kids go off to college and turn them into b and b’s and I can tell you it’s VERY challenging to let go of your stuff. No matter how respectful people are, things will happen, stuff will break and you cannot possibly put enough “rules” in place to keep that from happening. Personally, I am put off by properties that make me sign off on a do’s and don’ts list. I’m supposed to feel at home, cared for, not like I’m intruding on someone else’s privacy. Myth #4: It’s always going to be fun. I can tell you that in 10 years of doing this, 98% of guests are lovely and yes, it IS fun. But there is no such thing as perfect and there are always going to be people or situations that will test you. They will test your patience, your attitude, your physical endurance and sometimes your ability to keep guests from getting into awkward conversations about things that may cause discomfort for many. Believe it or not I often find myself playing mediator with guests, trying to actively steer the topic of conversation to things that are more neutral like the weather, kids or food. There is also the fact of the matter that nobody is perfect every day. You will get sick, you will have a fight with your spouse, you will wake up on the wrong side of the bed, you will fall and break your ankle, you will need to have surgery, you will burn yourself or cut yourself. Lots of things can and will happen. It’s inevitable. And the longer you are in business, the more opportunity there is for stuff to go wrong. Guess what though? There’s no such thing as calling in sick. When guests are paying to stay with you and to be taken care of, they come first. I can’t tell you the number of times I just sucked it up, took some medicine, put a smile on my face and showed up. Because that’s what innkeepers do. Show must go on no matter what. So would I recommend innkeeping as a profession? I can wholeheartedly say yes. I just encourage people to consider all these things before making that decision and the commitment. You give up a lot by making this choice. A lot of privacy, a lot of solitude, a lot of security and even a little sanity. But if you are the right kind of person for this job, you will find it just as rewarding as I do.